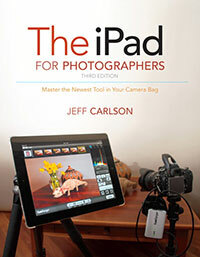 In his audio review of the book on Pixiq.com, photography and Photoshop instructor John “Nemo” Nemerovski comments that “The iPad for Photographers is a real landmark book,” and details much of the content that photographers will appreciate, such as rating and tagging photos, tethering a DSLR and triggering it remotely, and more. Go listen, and also learn about Colby Brown’s new book Google+ for Photographers. This morning I did a Twitterview with Peachpit to talk about The iPad for Photographers, and I think it went really well. An hour flew by quickly! Read the transcript here. I’m answering questions live on Twitter this Wednesday at 11 a.m. PST about the The iPad for Photographers. Submit a question and you could win a free copy of the book! Peachpit has more information here. 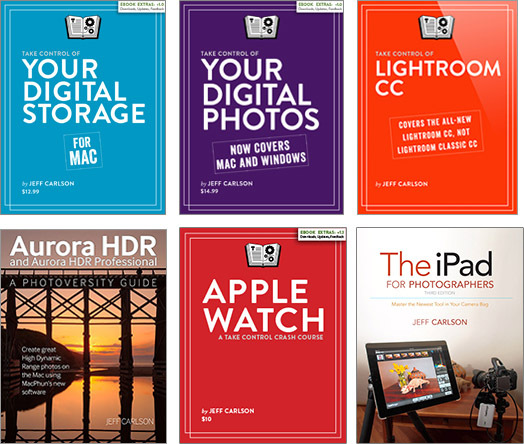 The iPad for Photographers is Peachpit’s ebook deal of the week! For $9.99, you get both EPUB and PDF versions of the book. The EPUB version provides the best readability when you want to highlight the text, while the PDF version showcases the great design of the book, with its large, full-color photos and layout. 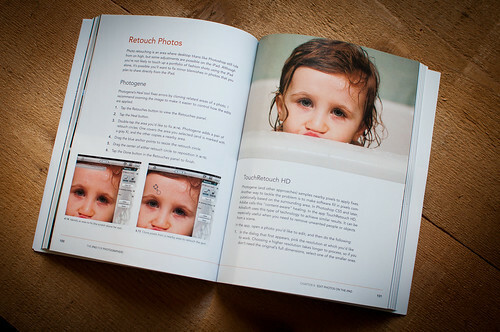 I love the way the printed book turned out, but you won’t always want to carry it along when you’re shooting. Since you’ll have your iPad with you anyway, the entire book is just a few taps away. Do you have questions about using your iPad with your photography? I’m doing a Twitterview (Twitter interview) about the book on April 25 at 11 a.m. (PST). Submit questions at Peachpit’s Web site and I’ll answer them live. If your question appears, you get a free copy of the book! If you want to just follow along, follow @jeffcarlson and @peachpit on Twitter, and look for the hash tag #ipadphotogs. I moseyed over to Amazon yesterday and saw that the print edition of the book is now shipping! Only $16.49 (34% off) with free shipping for Amazon Prime members. It looks like it’s also in stock at Barnes & Noble, too. Let me say again how proud I am of this book, not just because of the content, but because I worked hard to make it a great-looking photo book. I’m a fan of ebooks, but sometimes you need the paper version to flip through while lazing about on the couch. If you want the best of both worlds, order a bundle directly from Peachpit that includes the print book, an EPUB version, and a PDF version for $26.99 (that’s just $2 more than the regular print price.) You may not want to cart the book when you’re shooting on location (reducing the size of your photo bag is one of the points of the book), but you’ll have it on your iPad for reference. Also, I learned that some markets outside the United States are not yet able to buy the ebook version from the iBookstore. (Insert rant here about silly geographic marketing fragmentation, followed by “Ugh!”) Buying the bundle from Peachpit gets around that. 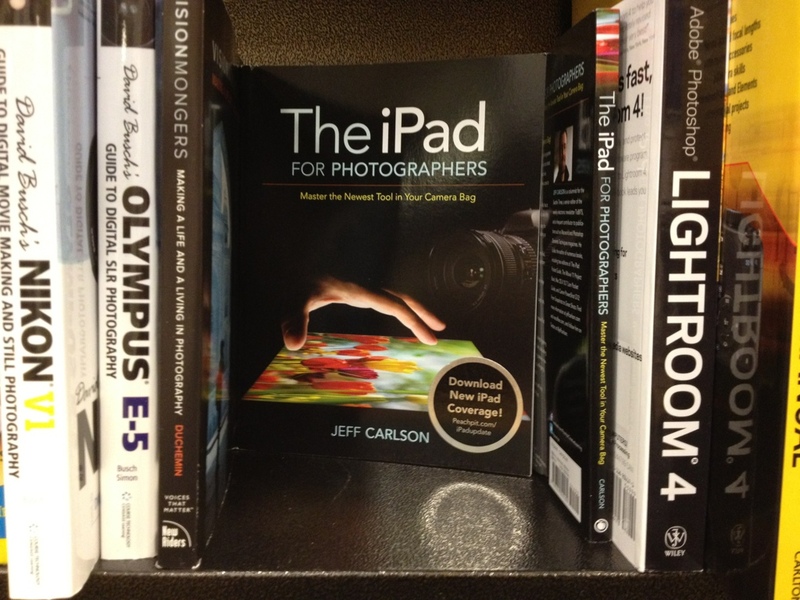 Oh, and The iPad for Photographers would make a great Mother’s Day or Father’s Day gift. I’m just sayin’. Thanks, and I hope you enjoy the book! Feel free to leave feedback in the comments, or email me at jeff@necoffee.com.